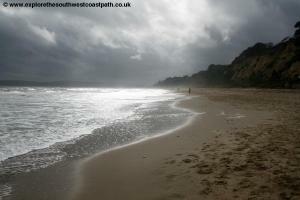 Just because the South West Coast path ends at Shell Bay, it doesn't mean your coastal walk has to. 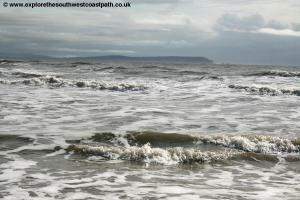 This walk follows the coast from Christchurch to Sandbanks, the opposite side of the Sandbanks ferry. For the most part the walk follows the flat and level promenade beside the beach although you could also walk along the beach if you prefer. The walk begins from the centre of Christchurch. Christchurch is easily reached from the A31 trunk road. Exit onto the A338 Bournemouth spur road and follow this to the Blackwater junction where you join the B3073 into the centre of Christchurch. Go straight on at all the roundabouts soon crossing over the railway station. At the large roundabout at the bottom of this road, with the A35 turn left (signed for Somerford and Lyndhusrt) and then park in the car park just on the left off this roundabout, where the Waitrose supermarket is. If you are coming by public transport, Christchurch has a frequent train service from London Waterloo via Winchester, Southampton and Brockenhurst and to the west from Bournemouth, Poole , Dorchester and Weymouth. These trains are operated by South West Trains. In addition there are also frequent local buses from Bournemouth and Poole operated by Yellow Buses and longer distance services from Lymington via Milford on Sea and Barton on Sea, operated by Wilts and Dorset. 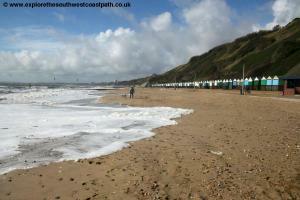 This walk is very well served by accommodation as both Bournemouth, Poole and Christchurch have a huge range of hotels to suit all budgets. 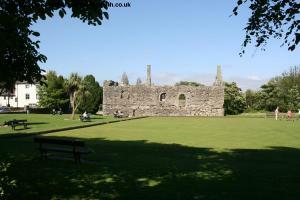 Self catering and campsites in the immediate area are limited however. For details visit the following sites. 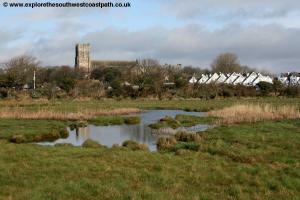 From the centre of town (Bridge Street) take the path alongside the river Stour, after crossing the river and passing the ruined chapel on the right. Keep to this tarmac path soon passing the beautiful Priory on the right. Follow the path as it turns to the right and soon reaches and ancient bridge.. Cross this and continue straight ahead now out onto Christchurch Quay. 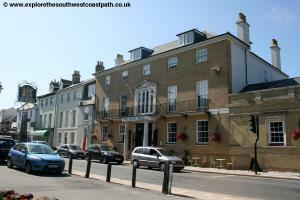 As you approach the Captains Club Hotel you have a choice. You can either cross the ferry here via the Wick Ferry for a small fee (if it is running) or you will need to head further west and cross via Tuckton Bridge. If you cross via the ferry, skip the next paragraph. To continue the walk not using the ferry go in front of the large Captains Club Hotel and follow the path alongside until you have a road on the left which you take. This soon runs alongside the busier road on the right. As this road turns to the left, away from the main road take the little spur off the road to the right and go up the grass to join the pavement beside the main road. Continue on this main road until you reach a roundabout. 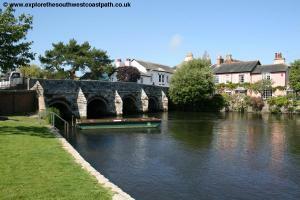 Here turn left and cross the river Stour via the blue Tuckton Bridge. 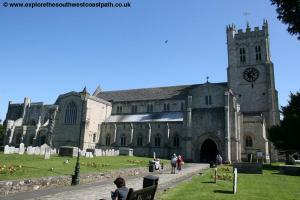 Once over the bridge, turn left into the Tuckton Tea Gardens and then follow the path beside the tea garden and then soon alongside the river along the wide gravel path, offering fine views back over the river to the priory. 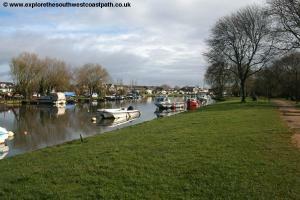 Continue along this riverside path until soon you reach the slipway of the Wick ferry. 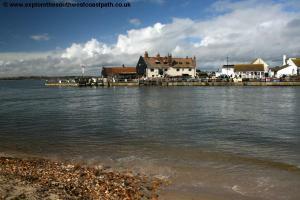 From the Wick Ferry follow the path ahead, signed as the Stour Valley path to Hengistbury. This initially follows the river but then turns right through a gate and away from the river on a gravel path between fences. Go through another gate into a field, which can be boggy and follow the path ahead through another gate and back onto a gravel path. 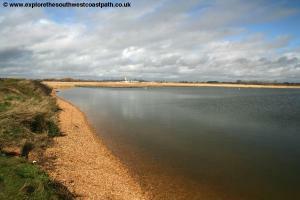 Keep to this good gravel path ahead until it emerges onto a minor road leading to the Hengistbury Head outdoor centre on the left. Here turn right along this road and just a few metres on take the path on the left (ignoring the Stour Valley path sign ahead) and follow this path to join a tarmac road in front of the soon to be Hengistbury head visitor centre (under development at the time of writing). Here turn left and follow this path. 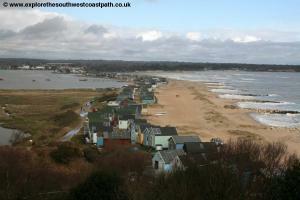 Note that this road is generally only used by the road train service out to Mudeford sandbank. 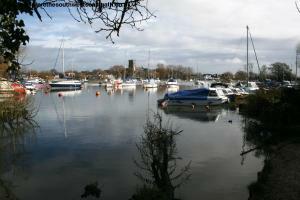 Soon you have the beautiful Christchurch harbour on the right, fed by two rivers the River Avon and River Stour which meet at Christchurch and flow into the harbour. 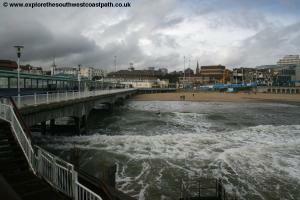 Soon on the left you have a gravel beach on the left. Here you have two choices. 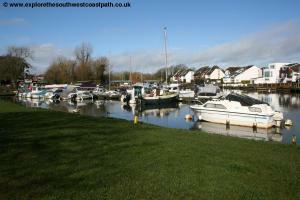 You can either stick to this tarmac track or take a more coastal route alongside the harbour. To stick to the main route, skip the next paragraph. 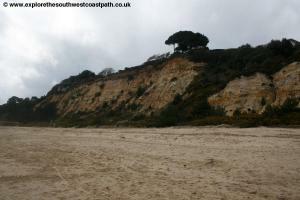 The coastal route can be reached by taking steps down to the left and then following as close as possible the harbour edge soon passing an old Pill box. 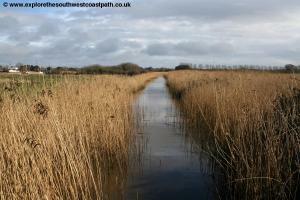 There are boardwalks and bridges over the wettest parts of the path. Soon this re-joins the tarmac path ahead. 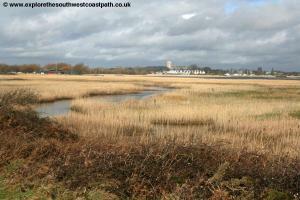 The tarmac path goes through woodland and then soon reaches Mudeford Sandbank, a narrow sandspit with the harbour on one side and the river coast on the other. 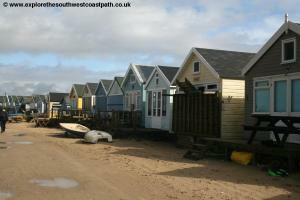 There are beach huts on both sides of the sandbank, painted in bright colours and there is something of a community amognst these beach huts. Incredibly, these huts can change hands for 6-figure sums as unusually it is permitted to sleep in them and you will notice quite a few have a small upper floor to allow for a bed. 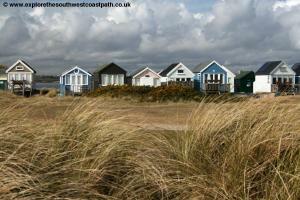 Turn left along the track along the harbour side of these beach huts and continue, passing a cafe on the right. Just past this on the left is a jetty from which a ferry runs to Mudeford Quay on the other side of the harbour mouth and also, less frequently, to Christchurch quay. Continue to the end of the sandbank, where there is a black tar-covered house. This is a now holiday flats but was originally a boat builders house but also with a history of smuggling. 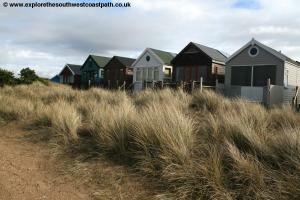 Round the house on the fine sandy beach backed by dunes and continue on the beach side of the beach huts, either walking on the beach itself or the path behind in front of the beach huts. 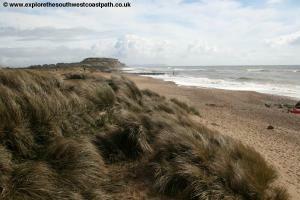 On reaching the end of the sand spit, take the steps up onto Hengistbury head and on reaching the top turn left for the view point over this unique sand spit. 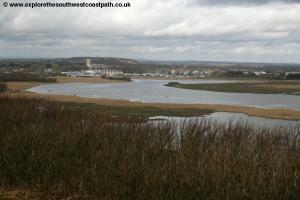 Continue left rounding the end of the spit and then following the coastal side of the headland, with fine views over to the Isle of Wight and soon of Bournemout ahead as well as in-land over Christchurch harbour. 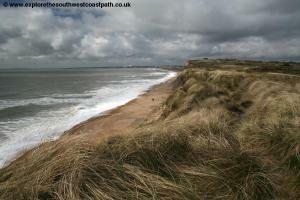 The variety of scenery in this area is surprising, with much of the top of the headland being an area of heathland. The path gradually climbs up to the trig-point and coast guard lookout and then descends more steeply down to a tarmac path. Here keep to the coastal side of the path continuing along the top of the low cliffs with a grassy area to the right (popular with kite-flyers). Continue ahead as the path soon becomes a board-walk over the dunes. Keep to this path until it ends and reaches a road. 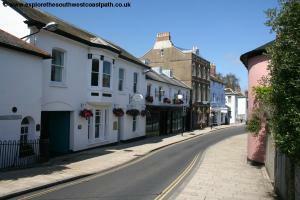 Here you turn left for a few metres until the road turns to the right to follow the coast, by some new houses ahead. Here you turn left down steps and follow the promenade. 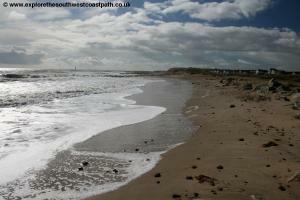 The remainder of the walk is a simple walk along the promenade or if the weather is fine and you prefer you can walk along the beach for most of the route although there are groin's along the beach at regular intervals they are not high so easy to climb over. 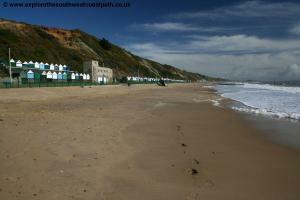 Soon you pass some beach huts and the amusement complex at Southbourne. 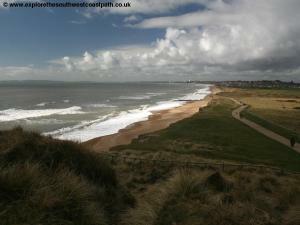 Continue past the cliff lift and keep to the main promenade path. 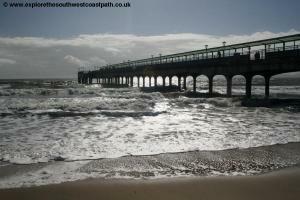 After a couple of miles you reach Boscombe with it's pier. Having been in decline in the recent past the local council has spent a lot of money refurbishing the pier and improving the area although the construction of an artificial surf reef has been less successful having never worked properly and been out of use for most of it's existence. 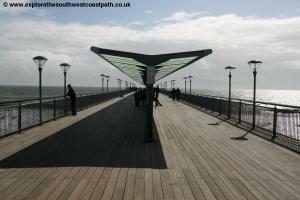 The pier at Boscombe is refreshingly simple with just a wooden board-walk and glass panels along the centre it is devoid of the amusements or theatre that are found on most piers. 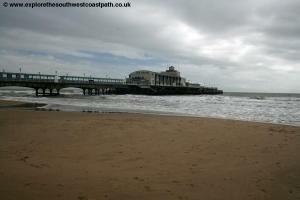 Continue along the promenade and in a little over a mile you reach Bournemouth and it's pier. 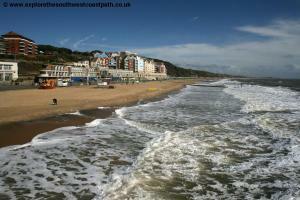 Inland from here are gardens leading up to the town centre whilst the pier itself has amusements at the shore end and a theatre at the far end but it is worth noting a toll is charged to access Bournemouth pier for much of the year. 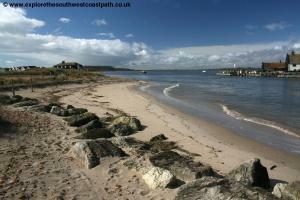 Boats also leave here for Brownsea island in the summer months. 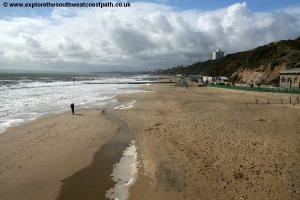 Continue on the promenade beyond Bournemouth. 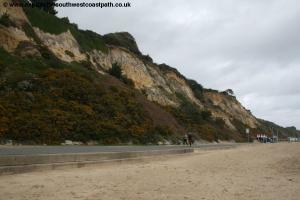 After passing the Bournemouth International Centre on the cliff top you soon reach the first of a number of Chines (steep-sided) valleys that cut through the cliffs, a feature of the area. 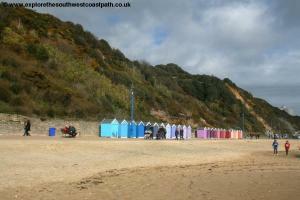 Continue west as the area becomes less busy as you leave the centre of Bournemouth and reach the last of the three chines closest to Bournemouth, Alum Chine. 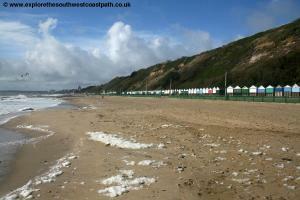 Continue to Branksome Dene Chine and and then Canford Cliffs, where the beach is a little more rural and we have crossed from Bournemouth into Poole. As you approach Sandbanks the promenade ends and you either have to continue along the beach or take the road just inland instead. 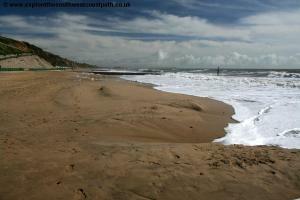 The beach should be possible most of the time unless the tide is particularly high. 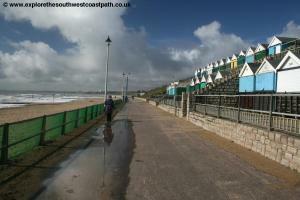 Soon you reach the main beach at Sandbanks, which has al the usual facilities and where the promenade restarts. After the main beach area of Sandbanks the promenade ends again and again you can continue west along the beach, with dunes between the beach and houses in places. Continue and as you get near to the ferry the beach becomes narrow and backed with rocks. 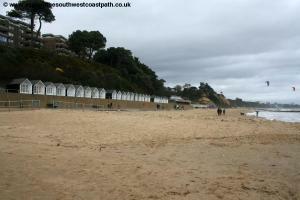 It is possible to continue along the beach here and then on the rough concrete area behind the sea wall of the Haven Hotel where there is a ladder up the sea wall into the little car park by the Sandbanks ferry. If this is not accessible or blocked by the tide, there is a footpath leading up to the road just after the sand-coloured brick building with beach huts at the beach side. On reaching the ferry the walk ends. 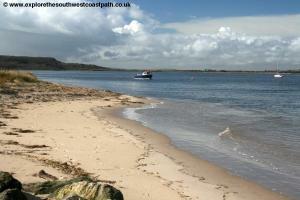 From here you could cross on the chain ferry to Shell Bay and the beginning of the South West Coast path. To get back to Christchurch from the bus stop at the Sandbanks ferry Wilts and Dorset bus service 50 runs at least hourly Monday – Saturday and every two hours on Sunday back to Bournemouth Gervis Place, a journey of around 25 minutes. In the summer month the bus runs more frequently, up to every 20 minutes. 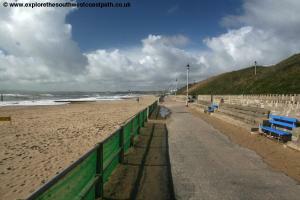 From Bournemouth Yellow Buses routes 1A, 1B, 1C and 21 run back to Christchurch with up to 15 buses an hour running. In addition Wilts and Dorset services X1 and X2 also run up to twice per hour from Bournemouth to Christchurch. 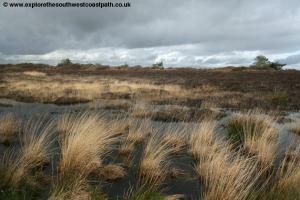 Here are some photographs taken on this walk. Click each image for a larger version. 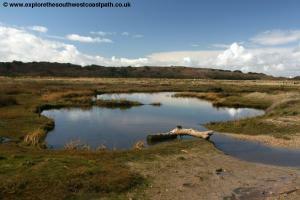 Ordnance Survey OL22 (New Forest) and OL15 (Purbeck and South Dorset) cover this section of the coast path and are widely available locally and nationally.